Down in New Orleans, a young superstar’s waiting in the wings, and we’re not talking Trombone Shorty. Actually, Anthony Davis is more wings in waiting, a 21-year-old specimen with a 7-foot-6 wingspan who belongs on the short list of legitimate NBA MVP candidates and means everything to Big Easy basketball. A walking double-double with the league’s most prolific shot-blocking prowess, Davis alone makes the Pelicans appointment television, but it’s his supporting cast — acquired this summer both by trade and from the infirmary — that will ultimately determine whether we’re still watching come late April. Davis averaged 20.8 points (58.2 TS%), 10.0 rebounds and 4.4 combined blocks/steals last season — submitting a 26.5 PER that ranked behind only Kevins Durant and Love and LeBron James — and yet New Orleans finished 34-48 in part because of season-ending injuries to Ryan Anderson (neck), Jrue Holiday (tibia) and Eric Gordon (knee). Even Davis missed 16 games with hand and back problems. All appear healthy, save for Tyreke Evans, whose hamstring injury is an ominous start to 2014-15 for another shallow pod of Pelicans, even if he’s scheduled to return around the start of the regular season. Still in charge of basketball operations after sending Greivis Vasquez and Robin Lopez — two 20-somethings who contributed to a pair of playoff runs in 2013-14 — for the right to sign Evans to a four-year, $44 million deal, Dell Demps finally replaced the self-described and under-appreciated “Screech Powers of the NBA.” The Pelicans sent their 2015 first-round pick to Houston in exchange for 7-footer Omer Asik, whose rim-protecting ability ranked only slightly behind that of Lopez last season. Of course, Demps has also now filled holes left by both Vasquez and Al-Farouq Aminu, who signed a two-year minimum contract with the Mavericks this summer, with a 34-year-old John Salmons and Jimmer Fredette, the sharpshooting former top-10 pick who couldn’t crack the Kings rotation. After leading the then Hornets to the playoffs in his first season at the helm, New Orleans coach Monty Williams has won roughly a third of his games since the departure of Chris Paul and David West. In addition to ranking among the worst defenses in the league each of the past two seasons, the Pelicans have played at an awfully slow pace, and that should be cause for concern, since Monty’s best player thrived in transition on Team USA this summer and headlines a roster among the NBA’s youngest. Once again, the playoff potential falls on the considerable shoulders of Davis and the health of his fellow top-six rotation players. In other words, little has changed. 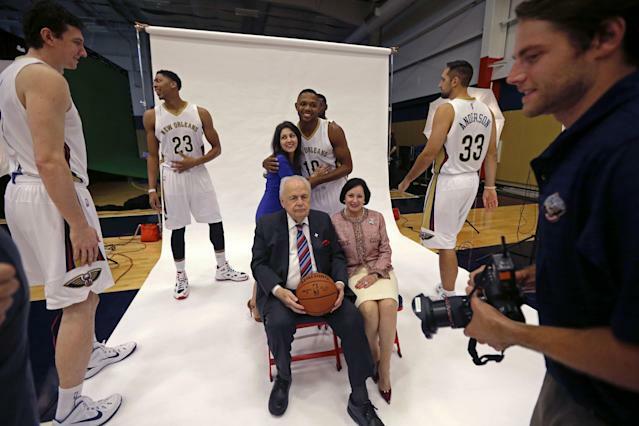 The Pelicans are still waiting in the wings. That weird bird sure was scary. for he is fledgling no more. The Pelicans finished last season with a healthy starting lineup of Evans, Austin Rivers, Darius Miller, Alexis Ajinca and Jeff Withey — beating the Rockets, by the way — and will send out Holiday, Gordon, Evans (if the hammy heals in time), Davis and Asik when games begin again, so … yeah. The summer helped, particularly from a health standpoint, and Asik adds another dimension to a defense in need. Still, New Orleans lost two key contributors to free agency — Aminu (2,045 min, 7.2 ppg, 6.2 rpg, 51.6 TS%, 13.2 PER) and Anthony Morrow (1,426 min, 8.4 ppg, 57.0 TS%, 13.9 PER) — replacing them with the well-traveled Salmons (1,726 min, 5.2 ppg, 2.1 rpg, 46.2 TS%, 7.8 PER for the Kings and Raptors) and much-maligned Fredette (519 min, 5.6 ppg, 57.8 TS%, 15.8 PER for the Kings and Bulls). Barring the emergence of Rivers (eh), Miller (hmm) and second-round pick Russ Smith (nah), the Pelicans will be shallow on the wings once more. So, maybe the summer wasn’t so hot, after all. Obviously, it’s Asik. His presence, if nothing else, pushes Davis back to his natural power forward position. On the defensive end, Asik’s rim-protecting paired with Davis’ shot-blocking should wreak havoc, and as good a rebounder as Davis has been, Asik’s grabbed them at a higher rate. Offensively, the Turk remains a below-average finisher around the rim, but Davis’ improving face-up game should open up easy opportunities for Asik to clean up the mess. And Anderson as the third big man in adds another wrinkle, allowing Williams to match up with any opposing frontcourt combination. Beyond Holiday, Gordon, Evans, Davis, Asik and Anderson — a more than respectable top six — the seven remaining Pelicans who played in the league last season combined for 3.1 estimated wins above replacement players. Among that group, only Alexis Ajinca cracked the top 200 (188th) in that category, and the three players they seem set to rely most heavily upon — Rivers, Salmons and Fredette — combined for minus-0.3 EWA. Add a late second-round pick (Smith) and an undrafted rookie (Patric Young) to that mix, and it’s a rather shallow pond in which the Pelicans will be swimming again. Who isn’t? Kevin Durant dubbed Davis “next in line” for MVP. Asik demanded his way into a trade for a starting center position. Holiday and Anderson hope to bounce back from the most significant injuries of their young careers. Evans and Gordon perpetually count themselves in this category. Rivers and Fredette are still trying to shed bust labels. Salmons will see if he has anything left in the tank. And Williams is coaching for his job. The Pelicans feature a roster full of contributors with plenty to prove. Davis has already broken out, so Rivers is the de facto selection here. The former top-10 pick delivered another scintillating Orlando Pro-Am showing this summer, although that’s yet to translate to much NBA success. Still, Doc’s son pledged to The Times-Picayune, “this is my year,” citing the additions of 10 pounds of muscle and an improved mid-range jumper to his game. So, we’ll see. Also, keep an eye on Miller. The Pelicans’ second-round pick in the same draft that brought Austin to New Orleans, Kentucky’s former Mr. Basketball steadily improved since being called up from the D-League in January. Davis submits an MVP-caliber campaign, and the Pelicans peck their way into a crowded Western Conference playoff picture, only to become first-round fodder for the established elite. Pelicans prefer to do the feeding, but a postseason glimpse is a positive step for young teams with grander goals. As in, “if their six top talents all miss double-digit games again” falling apart? Then, yeah, they’re looking at another lottery. And once again New Orleans could be left without a first-round pick if the one dealt for Asik falls outside of its reported top-3 and 20-30 protection. The doomsday scenario would have the Pelicans watching a third straight top-10 pick (Nerlens Noel in 2013, Elfrid Payton in 2014) fly the coop. New Orleans will finish at 44-38, last in the Southwest Division.